The following post is about a solitary desert adventure made in lieu of holiday merriment with friends or family. Enjoy the prose and occasional photographs and figures. Occasionally coordinates are mentioned; I encourage you to copy and paste them into your GIS of choice (e.g., the free online Google Maps) so you can follow along, so to speak. Trying to make a living in the U.S.A. again has had its weirdnesses. For instance, I've spent years ignoring U.S. holidays - "American" holidays - due to the dearth of countrymen at hand for reminiscence. Yet last Thanksgiving weekend I found myself cloistered within a California beach apartment as my friends, family, and even roommate were off somewhere else for their own feasts. San Diego felt dead - is that even possible? - and I had a whole four day weekend to spend alone. Palpable depression crept in. I sweated out most of the Day itself through gritted teeth and repeatedly chittered a tried-and-true "s'alright - just another day" mantra in between the requisite calls to absentee loved ones. (Why doesn't everyone just live here?! Oh, earthquakes, drought, and cost of living, you say? Hmm.) After I'd had enough anxiety and longing and regret, I planned an escape from that mental hell hole. ...And traded it for a geographic hellhole. No, seriously, "Hellhole Canyon" was on my list of hikes to investigate once I got my hands on the necessary topographic map. I decided to go back and visit Anza-Borrego Desert State Park, which I first explored two years ago on a west coast road trip. California's largest state park, Anza-Borrego spans some 60 miles north-to-south, from San Bernardino National Forest in the north to Ocotillo on the I-8 down south. It's the second-largest state park in the United States! The park covers and area about the size of Rhode Island!! Yup. Back in 2013, I borrowed a friend's tent and sleeping bag for a night alone on one of the desert's mountains. I had been browsing around satellite pictures of SoCal looking for an adventure when I found it - and when I found out that it is one of the few parks in the U.S. where camping is permitted everywhere, I was hooked. At 2500' on the eastern slope of San Ysidro, I set up my tent for a balmy 50 degree Fahrenheit evening. Flash forward to Thanksgiving weekend 2015, much later in the year than my last trip, and with a large coast-to-desert rainstorm to start the weekend. Flash floods, anyone? Friday's Yaqui Pass campsite, with the Mescal Bajada to S.
ridge at 1700' overlooking the Mescal Bajada and the North Pinyon Mountains to the south. Just coming to terms with that sentence is incredible. It is not that these named places are uniquely stunning, though they are, but that they are just so observable. Let me explain. As an ocean scientist by training, I have much more familiarity with the seascape. And bathymetric maps, the subsea equivalent of a topographic map, while useful, depict an area that changes quite regularly. The force of currents and tides and storms is more frequent than rain over a desert. Thus in the sea, the benthos (bottom habitats) are always changing; fifty-foot high kelp forests grow and disappear, cliffs tumble apart into sandy slopes, slopes collapse into canyons. Yet seawater conceals the ocean's breadth to human eyes, absorbing light quickly. In a desert, there are no forests to obscure the view of the bare rock of our planet, whose rubbly crust responds to gravity only when sporadically shaken or washed loose, wending its way down into piles of sand. It is the desert that smacks us with Earth's vastness and openness, where its presence can be acknowledged, questioned, and explored less mysteriously and more invitingly to our terrestrial souls. Temperatures were forecast to drop to 39 F, so I stayed close to the road (a half mile) in case I misjudged the thermal capabilities of my body or this year's borrowed sleeping bag. The storm clouds that had covered the sky all that day unleashed heavy rain west of the mountains and the park's basin; continuing their drift eastward thinned them out over the barrier peaks, reducing their impact to a chill wind that rattled my un-staked tent all night and wheezed ice crystals across the landscape, through my tent's vents, and over my sleeping face. 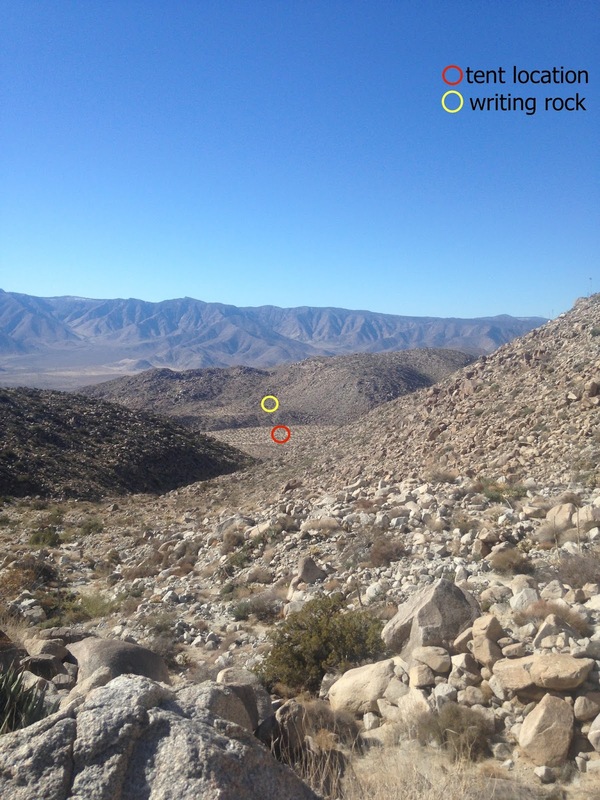 Overzealous hydration during the day (and a self-congratulatory libation in Borrego Springs before hitting the trail) found me frequently waking to urinate. Given the cold, this task would have been much less enjoyable had the dense clouds not blown away and exposed a brazenly full moon. The midnight sun lit the landscape as artfully as a movie set; colors were easily discernible, tinted with blue and gold and black. I cursed myself for cutting my nicer camera out of my gear bag to save on weight - a slow-shutter would have given you 1,000 words, shortly. I basked in that eery glow, transfixed, while competing with coyotes to claim the land the old-fashioned way. My chest was heaving as I was drawn into my primal being. I silently scanned for the creeping shadows of mountain lions, chupacabra, or Gollum - snarling to myself, as "red in tooth and claw" as my surroundings. I howled. I howled again. I wanted to run, to hunt down the frail, but I knew I couldn't leave behind my water and warmth for a spiny cobble field to which I was no native. Instead I left my useless tent flap completely open to the moon above, inviting its power and any of the creatures it might embolden to come visit. Surely I've experienced far colder temperatures, but never so long relying on my own body heat as my sole source of warmth. My stagecoach. I'm eternally grateful for the friend that lent me her manual Mini; it shrewdly thwarted the spiny terrain. Empowered by the successes of the first night, I decided to carry out my more ambitious plan for the second night. Of course there were a bunch of adventures earlier in that Saturday as I, like the eroding sand, wended my own way around the park; for fun I stumbled down Yaqui Ridge when I woke up just to see how long it would take me to reach the sights I was seeing (25 leisurely minutes to the bajada road, SR-78, 0.5 miles and 400 feet of elevation gain). I also had to return to Borrego Springs to fill up with gas, cursing the lazy "city boy" disease I'd begun to contract that led to that oversight Still, it gave me a chance to tell the park staff I had indeed not died in the night, and to visit some of the sculptures littered throughout the Borrego Basin around the town. By late morning I was off, down the S3 out of Borrego Springs to the 78 to the S2 to Blair Valley, at which point I turned off road and drove seven miles to reach Smuggler's Canyon for my second night. For me the real event was the camping and the big Sunday hike out of the Blair Valley, so I've glazed over the human communities to return to that second night's campsite (33.014774 N, 116.344490 W). 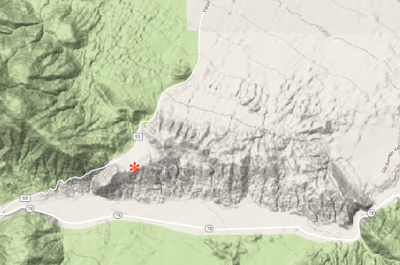 Saturday's camp in Smuggler's Canyon, between Blair Valley to W and Vallecito Mountains to NE. Blair Valley's higher altitude (3400') brought colder temperatures; the nighttime low as measured in Borrego Valley (~500' altitude) was an almost freezing 34 F. Without a thermometer, all I can note was that my water did not freeze. The park graciously allows campfires provided they are built within a metal container, and all ashes packed out. Thus curling my body around the trash can lid serving this very purpose, I burned a few slabs of untreated Ocean Beach alley lumber to stay warm and kill time before bed. Sunset brought the first licks of cold right at 17:00hrs. I had brought with me my scorpion hunting equipment, and attempted to go on a short walk as soon as it got dark with this purpose in mind, but after forty-five minutes of observing my own breath in the darkness (the moon did not rise until late in the evening), I decided I had best read more about scorpions and their seasonal cycles before expecting to bump into them as easily as in Baja or Bonaire. Some people might think these conditions sound like a lot of work, or inhospitable. Yet I find the solitude solemnly engulfing; the desolation is an enticing challenge, a temptation to stay away from all our human failings forever, and the solitude is a means to focus on the non-self and non-society. I pondered these things for two more hours as I burned the last of my wood, hands too cold to play the scribe. I had a long day planned for Sunday. Camping in Smuggler's Canyon; Vallecito Mountains rising in the NE. Writing on a hill saddling Smuggler's Canyon (left) and the Carrizo Valley. Arising around 07:00hrs, I hiked up a small hill just south of the tent (see right) to write. 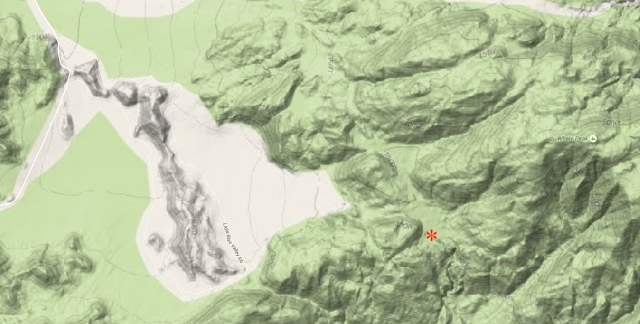 Using my topographic map, I made the final appraisal of my plan to summit Whale Peak (5,349'), the highest point in the Vallecito Mountains. It would be 2,000' of elevation gain over 2.5 miles, which I estimated from the day before to take me a leisurely two and a half hours each way, rounding it to three for mishaps given that this was all off-trail wandering. Recall that as camping is permitted anywhere in the park, the limits of exploration are solely up to the training, experience, and preparation of the adventurer. 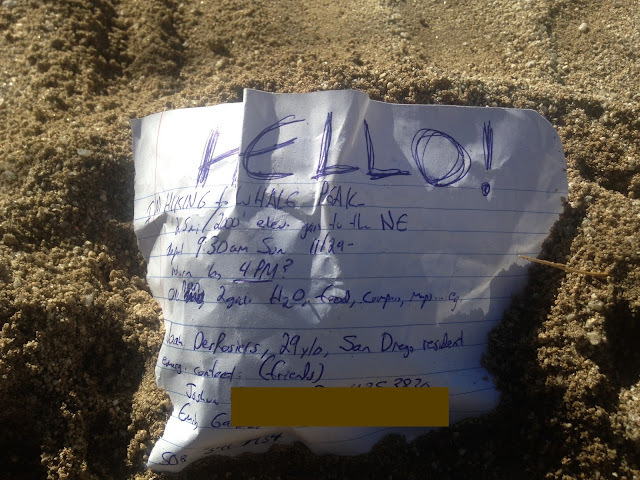 I packed up six liters of water and about 3,500 calories, wrote a note to leave behind with my tent should personal misfortune require a path of bread crumbs for park rangers to follow, and headed off to the foothills of the mountains to NE. The note I left in the dirt outside my tent. After crossing the flat wash of Smuggler's Canyon, I began my ascent up the creeks that cut through the Vallecito Mountains. Temperatures heated up to a wonderful 68 F or so, and the rocky hills were tufted with my favorite desert plants - the teddy bear cholla, the ocotillo, and the mescal/agave/century plant that was so important to indigenous tribes - although these deserve their own post in the future as their appearance and lifestyles are endlessly fascinating. Of course, they are also very painfully spiny - the cholla (CHOY-ya) earning the nickname "jumping cactus" for the uncanny ability of its spines to leap onto/into skin and clothing with the slightest of touches. This requires one to be even more aware of one's footsteps than when hiking the forested east coast of my youth. After an hour of weaving my way up a single steep canyon, I had made my first ~600 feet of elevation gain and had earned myself a wonderful view of the Carrizo Valley to the SE - I could not see the vista from my tent or even the small saddle ridge I'd been writing on that morning; the height afforded the necessary angle. The S2 highway followed in this valley for at least 15 miles on its way to the I-8 down south. After some sips of water, I pressed on - noting that the steepness I had initially regarded as 'manageable' was becoming a bit trickier. As mountains weather, water and wind cause materials to flow down them, eroding little concave canyons/valleys into the slopes between convex areas the water diverts around. As the canyons converge near the first ridge here, at 4,400', there were multiple paths to select, although their height precluded a full assessment of the strenuousness of their full ascent. It was here that my mind began to doubt, to remind myself that this was foreign territory - mostly literally, but also a little figuratively. Why not just traverse the mountain at the same altitude a bit first until I found a gentler route? I told myself it looked tough, but not impossible. Might as well continue. At 4,300' looking SSE into the Carrizo Valley; the Sawtooth Mountains on the horizon are seven miles away. "DEFEAT implies that the only SUCCESS is the single stated goal, in this case the vertex of a summit [Whale Peak]. Because of how we speak, it is difficult to name this halting anything BUT a failure of that goal. But which stronger human passes me? I am alone. Which prize awaits me? Only my own. What utility does it have? Only a story in the past. "...the reason that the true adventurer continues or stops is to address whether this is an acceptable final adventure." I am an ocean man. Whale Peak, though piquing my ocean scientist curiosity - how many whales are up there, e.g.? - was not the adventure I'd remember to tell my kids - but rather sails and dives to occur sometime other thank Thanksgiving 2015. 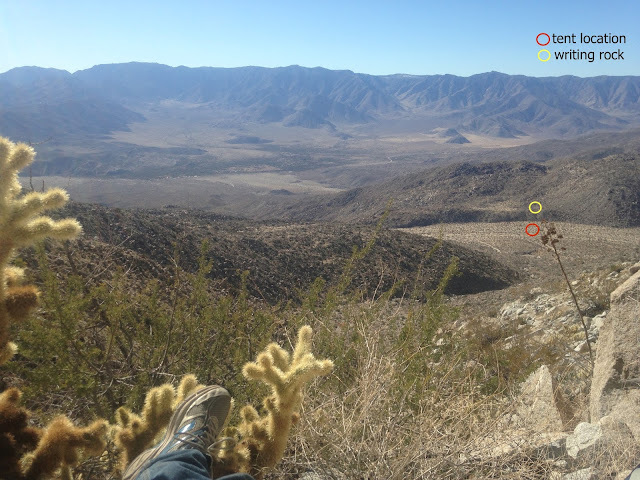 I grudgingly began the hike back to camp - but now with hours and hours of extra time, I was able to lay out on the warm afternoon rocks and just meditate on the nature around me. In my silence, various birds lost their fear and approached, stealing seeds or such from nearby agave. I made friends with soaring crows cawing down to me; in answering them, they came closer and perched on rocks to listen to my excited monkey giggles. I imagined them as the spirits of ancient tribespeople, ever curious about the visitors to their lands. Meditation site in a dry creek on my way back down the Vallecito foothills. Libations @ the Lazy Lizard. From above Smuggler's Canyon I could see a couple souls wandering the trail to an overlook at the end of the valley, of which I have no photograph. When I made it to my tent and began packing it up, a woman walked by asking about the note. She had wondered about me and asked how it went. In my goofy fox hat and aviators, after such a pensive morning, I must have seemed quite strange; I met no other people over the entire weekend that were camping out of doors. I got in the car, drove down the S2 to Ocotillo, and prepared for the long drive west to San Diego. Fortuitously, a watering hole in the small town afforded me some weekend closure with a couple desert residents. I met a fairly senescent man who had won $10,000 in the local lottery and shuffled in to fill out a winnings form. Another with a formidable paunch came in for frozen pizza, taking a break from his services as a junk hauler for the community. It was calming and warm. From here on out, I have no further narration to recount to you aside from some loose photographs. I hope you enjoyed the prose reviewing the actions pursued by my drought-addled mind... The trip made any holiday woes obsolete, and left me with more leathery skin in the process. Thanks for coming with me on this journey, being the other that I write to and for, and enjoy. Can you spot the Mini? I'm parked on a ridge overlooking the Carrizo Badlands (off picture, left).